Music Professor Jim Hegarty (C’76) and alum Ashley Alarcon (US’10, C’14), a professional flutist who performs and teaches in the U.S. and Mexico, led eight students on the “Sights, Sounds, Traditions” international field program, which focused on music and culture in Mexico City. All participants are taking a music history class this semester, which provides context for the trip. 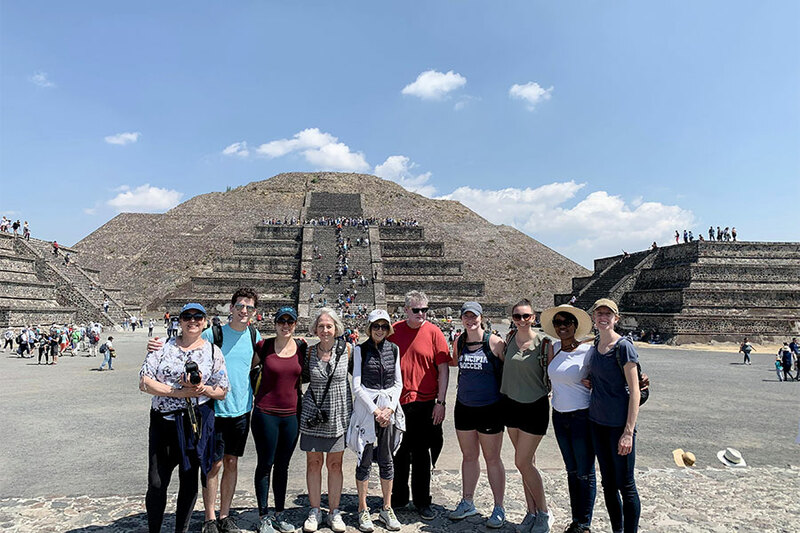 While in Mexico City, students visited the National Museum of Anthropology, climbed pyramids in the ancient Mesoamerican city of Teotihuacan, and explored Zócalo, a cultural epicenter. Performances at Ballet Folklórico de Amalia Hernandez and the National School of Music and a private concert of indigenous Huastecan music offered insight into the key role music plays in contemporary Mexican society. Attending a service at the First Church of Christ, Scientist in Mexico City provided a special opportunity to meet members and practice conversational Spanish. The 16 students who traveled to Trinidad with biology professors Dr. Scott Eckert (C’79) and Dr. John Lovseth (C’05) researched marine conservation in the world’s second-largest nesting colony of leatherback sea turtles. The largest living reptile, leatherbacks can weigh up to 2,000 pounds and be up to seven feet long—and the group observed more than 50 of them! As the turtles came ashore to lay their eggs, students evaluated their behavior and collected and interpreted data. The group also worked alongside Lovseth and local foresters on forest biodiversity projects, explored Caroni Swamp by boat, identified birds on nature walks, visited the workshop of a steelpan maker to learn about the instrument and its cultural significance, and saw artisans demonstrate how they use local ingredients to make chocolate and turn waste glass into beads for craft sales. Students also enjoyed hiking through jungle terrain and swimming in pools by tropical waterfalls. For seven students on the San Francisco photo-documentary field program, led by Mass Communication Professor Stephanie Bauer and Visiting Professor Paul Van Slambrouck, the city provided a dynamic backdrop for taking pictures and studying its people and neighborhoods. With cameras in hand, students visited such iconic landmarks as the Golden Gate Bridge and Chinatown to capture the visual interest of the “City by the Bay.” The burgeoning hipster-tech neighborhoods south of Market Street, Italian cafés of North Beach, and murals in the Hispanic Mission District offered a feast of color and light—and countless opportunities to practice telling stories through photographs. Arden Wood, the Christian Science care facility in the Sunset District, provided housing and a workroom, offering an ideal launching point for the group’s explorations. David Lovegren (US’73, C’77) led what has affectionately been nicknamed the “Hollywood Abroad,” a spring break trip to meet professionals in the entertainment business. The five current students (and one Upper School alum) in the group spoke with a range of professionals at Disney Studios, Warner Brothers Studio, CBS Television, FotoKem Labs, and other Hollywood enterprises. The group kept a full schedule, making as many career connections as possible. Thanks to Lovegren’s extensive contacts built during his successful Hollywood career, students enjoyed access to directors, writers, actors, screenwriters, cinematographers, and other professionals that a regular spring break tourist would never have. Lovegren even tailored the itinerary to match students’ interests. Sun, surf, bright skies, and sandy beaches—the sought-after elements of stereotypical college spring breaks—were a definite bonus for students on the Reflections trip to Gulf Islands National Seashore in Florida. But they weren’t the focus. Instead, the emphasis was embedded in the trip name, Reflections. Most of the 14 students (plus two resident counselors) used the daily solo time to unplug from devices and practice the waning art of stillness—with an emphasis on profound spiritual listening. Later each day, group activities such as exploring historic Fort Pickens, cooking dinner together, and sharing humor and gratitude around the campfire provided plenty of laughter and fun. Camping close to the beach included a special bonus this year—a beautiful full moon! Take a peek at the students' travels in this slideshow.